As many times as I may have said this, how I do not like winters one bit, there is no denying that I love the food that my mother used to dish during winters. Those were the days when only seasonal produce was available and she used to make the most of it all. There are so many dishes which are childhood favorites (the only time I ate well was during winter since I loved the winter produce) and perhaps which many in the next generation are not even aware of. And I really want to catalog such precious invaluable recipes that have been handed down generations and which I fear are likely to get lost in the times of the fast-food-crazy culture. 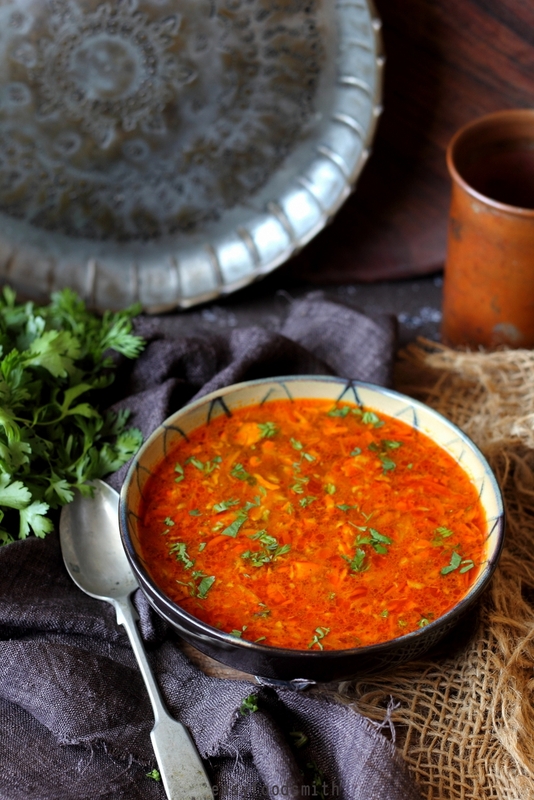 I believe my blog space would be incomplete without presence of such recipes. 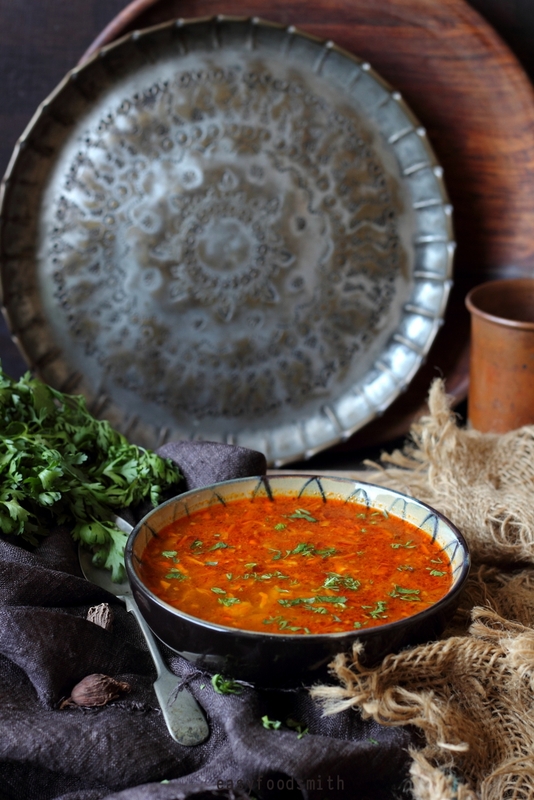 Today’s recipe is a typical old–style and rustic Punjabi way of beating the winter blues. 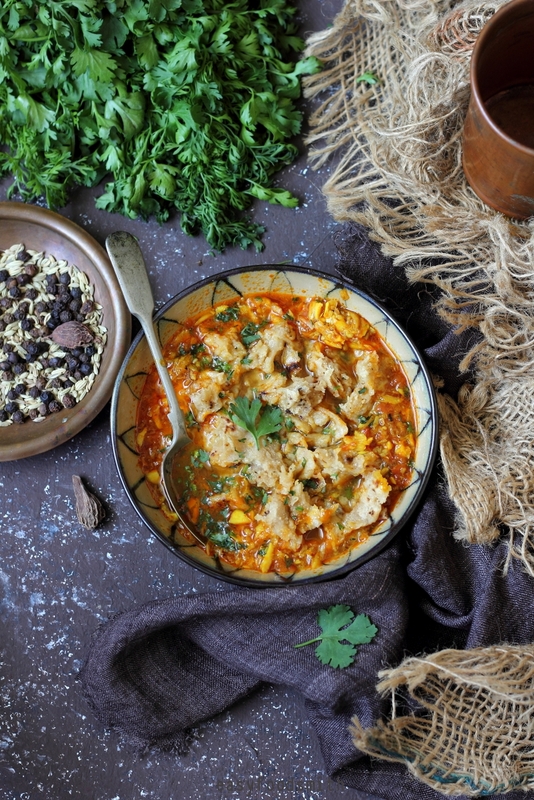 The curry is spicy, hot, sour, aromatic and so nostalgic. The day my Mum would cook this for dinner, I would be one happy girl. 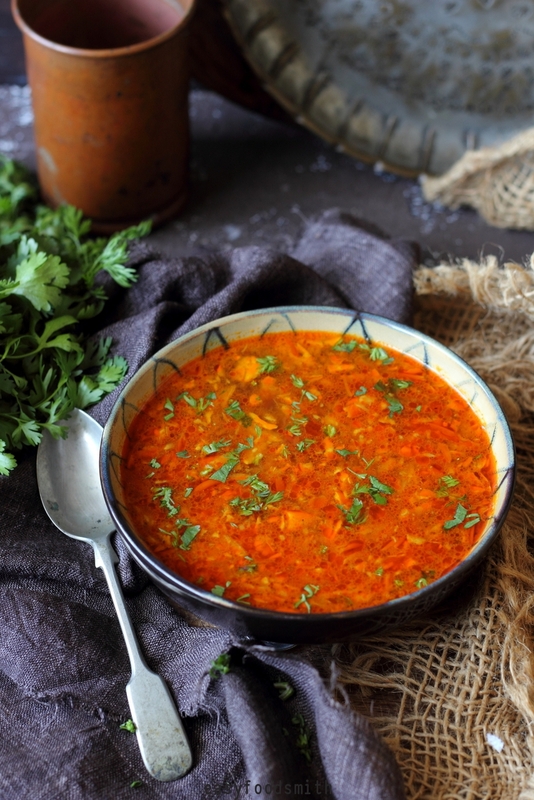 It may sound like a weird dish to have, with just ginger, garlic & tomatoes and lots of watery curry but this recipe is one that will keep you from falling ill in the winter. I cannot recall ever falling ill during winters. 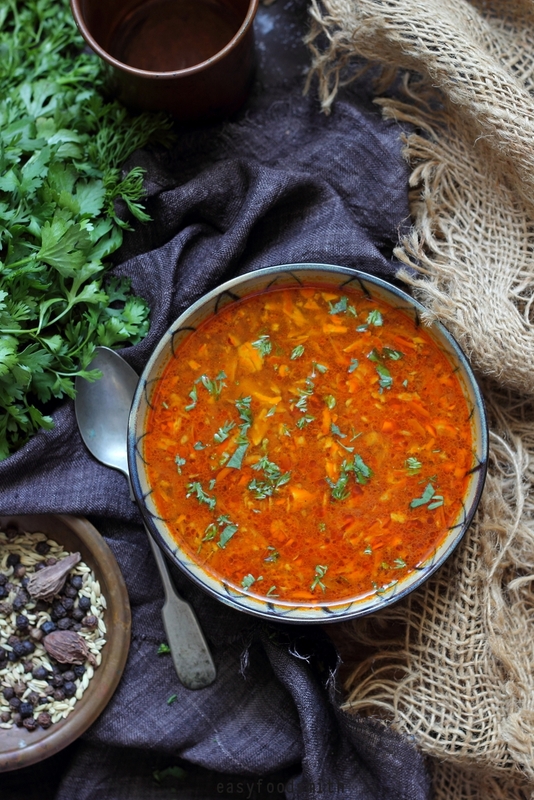 The natural ingredients that were used in making traditional recipes took good care of keeping the cold and flu at bay. Recipes such as Meethi Sonth with hot glass of milk and Lup’pi were consumed by everyone on regular basis and helped us sail through the bitter and harsh, cold and windy north Indian winters. So basically, food was our medicine – preventive and therapeutic. Isn’t it wonderful how nature showers its bounty upon us and takes such good care of us! Someone rightly said let food be your medicine. 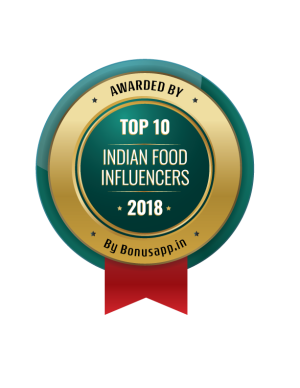 It is time I guess, to indulge more in our desi recipes using local ingredients and applying the ancient culinary knowledge & wisdom that was curated and handed down by generations. Spices, when used judiciously, are such magical ingredients. They add flavour and so much goodness to our food. The only way I have known to enjoy this piquant curry is for it to be served piping hot with crushed hot roti. You can try it with rice if you may. Coarsely ground the fennel seeds, black cardamom seeds, cumin seeds and black pepper. Set aside. Remove it and set it aside. Cut ginger into small pieces and bash the ginger to make paste (not too smooth) without using water. Halve the tomato and grate it or roughly chop them and then grind them to attain tomato pulp. Set aside. Set the cooking pot on medium heat and add ghee to it. As the ghee begins to heat, add garlic paste and cook it for a few minutes or till it begins to turn golden. Keep stirring continuously and tossing the garlic around to prevent it from burning. Add ginger paste and cook till the ginger is cooked and the ginger & garlic give no raw smell. Keep stirring continuously. Reduce heat and add the ground spices along with red chili powder, turmeric powder and salt. Stir for 10 seconds and add tomato pulp. Increase heat and cook till the masala releases oil, stirring frequently. Add water and cook for 3 – 5 minutes. Adjust the amount of water to attain consistency of your choice. I love all those warming spices! The curry sounds and looks great. This looks like a tomato soup but loaded with spice flavor! It is winter here and quite cold so this is just perfect! Wow, this sound delicious and yes, perfect for the cold weather with all the spices in it…I can only imagine the fragrance of this dish…thanks for sharing it. Have a wonderful week Taruna! It’s below zero (F!) here today, so you’d not like our weather at all. I don’t either. 🙁 So I need this dish to warm me up! This looks really terrific — love all the flavor. Thanks! I saw in the news how mid west and east America is freezing! Stay safe and stay warm.